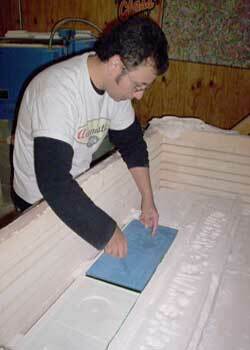 Above: Tim Tate creates impressions in the dry plaster. 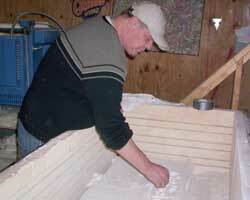 Above: Michael Janis and Tim Tate close the kiln. 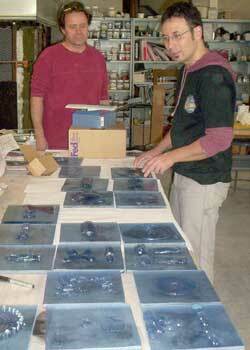 Above: Michael Janis positions blue glass over the impressions. 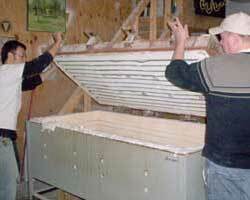 Above: Erwin Timmers and Michael Janis work on assembling the panels. Michael Janis, Tim Tate, and Erwin Timmers of the Washington Glass Studio in downtown Washington DC created A New World View by molding blue glass. They pressed objects into plaster of paris powder and removed them to leave detailed impressions behind. They then placed sheets of glass over the impressions and put the whole assembly in a high-temperature kiln, where the glass melted into the plaster forms. As part of the art project, the World Year of Physics team collected over 300 pictures of children from families around the country. The Washington Glass Studio artists selected 34 of the pictures, which they felt enhanced the message and appeal of the artwork. The artists made transparencies of these 34 pictures and attached them to mirrors. The mirrors were attached to the back of the glass panels. The artists then mounted the panels as three vertical columns, each with eight panels, on four iron frames.